Open Exhaust : Aquaplaning, Toledo, 1916. A. T. Griffith, Peoria, Illinois. Volume 7 Number 7, 10 December 1916. Aquaplaning or surfboard riding has become one of the most popular of aquatic sports in connection with motor boating and at this particular place near Toledo the fad has scores of devotees. Though many ladies are skilled in riding the balky surf board, it takes a Thorobred to ride as this one does. 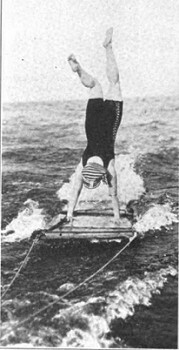 Nor is this the only stunt she does - she has a number of enchores which have this one beaten a mile-including standing on one hand, and then on her head without touching her hands to the board. Needless to say, a steady and reliable pull is necessary to give the board the perfect balance necessary to the performance of these feats, and it is imagined that you already have guessed that this “thorobred" girl is per- forming behind a boat equipped with a Thorobred Motor. Though we must still remain reticent regarding the young lady, Manager J. R. Trautner of the Red Wing Motor Company has confided to us that the picture comes from Mr. B1-ownson. of Toledo, who owns two Thorobred (motors) and that both perform just as capably as the young lady on the board.